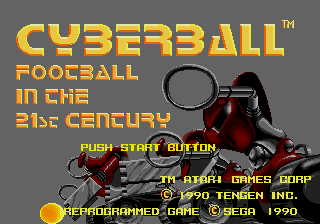 CyberBall (サイバーボール) is a 1989 arcade sports game by Atari Games based on handegg. Sega ported it to the Sega Mega Drive in 1990 under license from Tengen. In Japan, CyberBall supports the Sega Mega Modem, and plans appear to have been put in place to bring this functionality to the US. Had the Mega Modem's US counterpart, the TeleGenesis been released, CyberBall would have likely been one of the first games to support it. Later it was announced the TeleGenesis version would be released separately, before all TeleGenesis projects were cancelled.